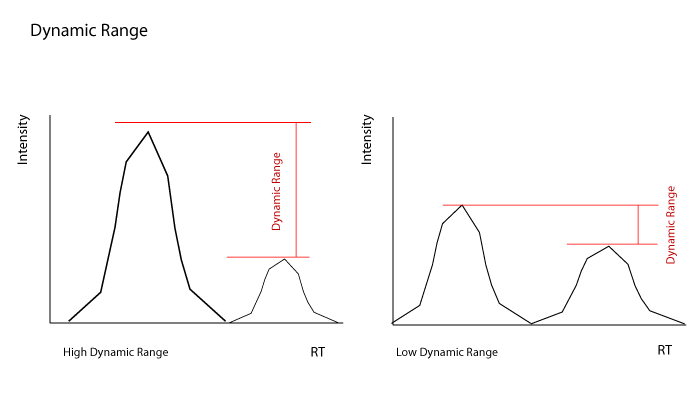 Higher Dynamic Range, that is, a larger difference in intensity between the smallest and largest MS1 peaks, can indicate improved sensitivity. The Dynamic Range metric is the ratio of a high intensity MS1 peak (which is more intense than 95% of the peaks) to a low intensity MS1 peak (which is less intense than 95% of the peaks). This metric only considers MS1 peaks that have an MS2 spectrum that has been matched to a peptide. It also only considers MS1 peaks that elute during the "Retention Spread," the elution time span where most of the peptides are eluting. Higher: A wider Dynamic Range means that the mass spectrometer can detect lower abundance peptides. The Dynamic Range measures how much signal is available for detecting peptides. This measure is sensitive to the amount of sample loading into the LC-MS system. A higher Dynamic Range is one way to see if the mass spectrometer is able to see less abundant peptides in the presence of more abundant peptides. A higher Peak Intensity says that all the proteins, even the less abundant ones are being detected at a higher value. The Trigger Point tell where on the MS1 peak the MS2 is triggered. Triggering higher on the MS1 peak means that more of the available ion current is being used for peptide identification. A higher value of the Low Intensity Trigger Point means that the less abundant peptides are getting a lot of the available ion current. A higher value of the Low Intensity ID Rate means that these less abundant peptides are being identified.